Weddings are full of incredible moments; walking down the aisle, the first dance, cutting the cake, and of course the reception. Each of those moments can be enhanced with the right music. 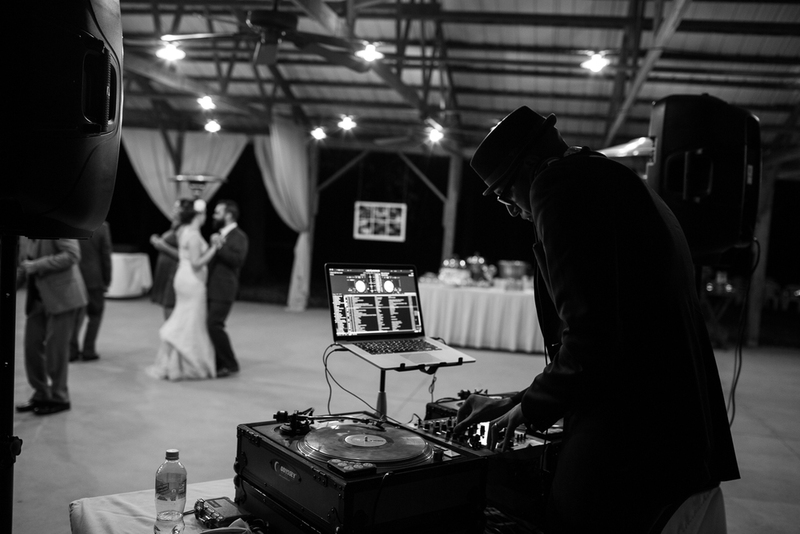 Whether it is Pachelbel's Canon in D for the ceremony procession or Michael Jackson's "Thriller" to get everyone on the dance floor, music helps tell your story. Pre-Wedding Consultations: It is your big day and your story to tell so it is important that we have an opportunity to sit down and discuss your vision. I make myself available for meetings either in person or via telephone or skype throughout the pre-wedding process. Song Editing: Sometimes that seven minute song you love is a little too long for your first dance. In those cases I can do studio editing to remove a verse or otherwise shorten the song to your liking. An example of this can be found below. Master of Ceremonies: Ensuring that the event remains on schedule and lively is an important part of any wedding. Introductions, announcements, and crowd interactions are all part of the services that I can provide. Professional Equipment: Top quality speakers and turntables, dance floor lighting and concert quality wireless microphones are all part of the equipment package that will provide your event with uncompromising sound. Music Timeline: I want to ensure that I understand your vision for the event. To do that I provide a "music timeline" that gives minute by minute detail of the event letting you know what time I will arrive and set up and other details such as what time each dance or speech will occur. It also includes a notional playlist that shows where I generally see the night going based on our discussions and your musical selections. Professional Club DJing: Perhaps the most important part of the service is the quality of the DJing. Unlike many other wedding DJs, I work in clubs and lounges every week. That means I am routinely reading crowds, mixing the newest music, and doing so at a very high standard. That experience is critical to providing you the best sound experience possible. Private Events: I am available for birthdays, sweet 16s, reunions, holiday parties etc. No two parties are the same, and I am excited to work with you to create a unique and wonderful event.